TJMS has had a native pollinator garden since 2015, but in spring 2018 Ms. Bell’s Science Yellow Jacket Period enrichment class put together a plan to rehabilitate the garden, which had become overrun with invasive species. You can read about our efforts in “real time” on our Facebook Page posts. COMING SOON: The Jefferson Pollinator Garden. We're all abuzz! Today's garden tasks: watering the peppers and hauling the weeds we've pulled to the compost. Photo: bug hotel in the pollinator garden. The second phase, beginning in late May 2018, was to clear invasive species from the existing site. We eventually dug the sod and invasive species out by hand in about 50% of our 40’x20′ pollinator garden, and tilled the remainder. That’s a lot of student and volunteer hours! Students and volunteers worked as quickly as possible, trying to finish up the garden preparation before the end of school so we could plant the natives that had been donated to the school garden, but we ran out of time. So over the summer, we moved on to Phase III. Phase III: Invasive-proof the Garden. AKA: Solarization vs. Occultation– which will be most effective? Since we didn’t manage to get our native plants into the pollinator garden before school let out in June, we put them in a holding space in the school’s AFAC garden, which is adjacent to the pollinator garden to keep them happy until fall. Then we decided to take advantage of the hot summer weather to help invasive-proof the garden. We had learned the hard way in our AFAC garden that tilling a garden is good at knocking back unwanted plants, but grass and other weeds pop right back up within days or weeks. After all the hard work the students put in clearing the garden of invasive species, we wanted to be really sure the natives would be able to establish without competition once they were planted. First, we researched. Our garden advisors were divided: which would be better, black plastic or clear plastic? Clear plastic “cooks” the roots and seeds of the weeds, and black plastic blocks out the sun. But which would work best for us? We found research indicating that black plastic hits the ground running (so to speak!) with good results, but that clear plastic was a clear winner over the long term. Since this is a learning garden, we decided to experiment ourselves, and purchased an equal amount of clear and black plastic to cover the garden over the summer. Second, we tilled. We tilled the half we’d already dug out and mulched by hand, as well as the rest of the pollinator garden which we’d mowed and cleared with a hoe. Early August 2018, the control area, which had been manually dug out but left uncovered. Early August 2018, the clear plastic was bursting at the seams with grass. Apparently, we created the perfect grass greenhouse with our clear plastic! It was really tempting to pull up the clear plastic and dig it out so that the space would be ready for the students to plant in September. But we remembered that solarization takes several months to take effect, not just the 6 weeks we’d tried it– and that this science experiment only has learning value if it’s there for the students when they get back into the garden in September! So we gritted our teeth and left the clear plastic installed. Now for the fun part! We spent all the rainy summer days researching native pollinator gardens. It's a rainy old day, so it's a good day to look through native plant lists to plan the pollinator garden grant we're applying for. What are you doing this gray rainy day? Eight steps to a pollinator garden (we are on step 4, but we got a jump start on step 5 already). How much sun vs shade will our pollinator garden get? Come back tonight at 7 and we’ll run the math for these measurements. More pollinator garden. Iron weed, cut lead coreopsis, coneflower, swamp milkweed, black eyed Susans, button bush, and more. Did you know that many of the plants at Mount Vernon are pollinator-friendly natives? Spent the morning learning and weeding with the master gardeners and master naturalists at the Glencarlyn Library garden. Have you visited their garden education station yet? We grew some native pollinators by accident, simply by ignoring home gardens and spending too much time at the school garden! Did you know that a garden left unattended can spontaneously erupt with milkweed vine (so sweet-smelling), black eyed Susans, pink wild bean flowers, evening primrose, and more? So we re-evaluated. Arlington Public Library’s native pollinator garden volunteers have offered us some of their extra plants when we help out at their volunteer days. 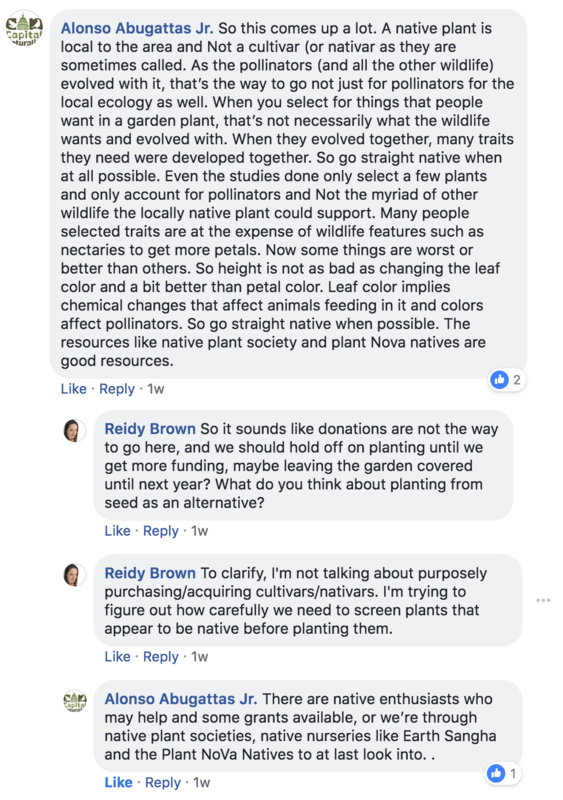 Some native plants we know we will be able to positively identify, because they don’t have easily confused cultivars/nativars. But we know we’ll need more resources to fill 800 square feet of garden! So we have begun to identify and apply for grants to help fund the remainder of this learning garden rehab. And we can fundraise directly with Donor’s Choose. Stay tuned to this page, or follow us on Facebook for live updates. The Yellow Jacket Period students will be back in the garden in late September, so be sure to check in to learn how our Occultation vs. Solarization project ends up and watch as our students transplant the natives we’ve been carefully tending all summer. 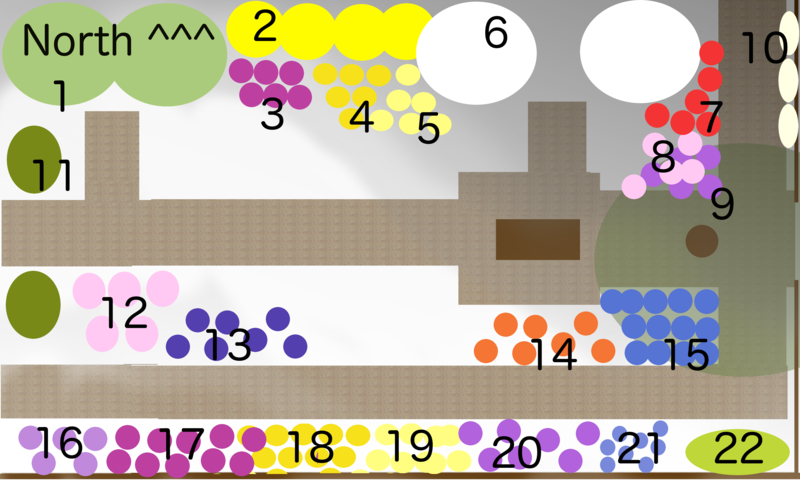 This is a draft planting diagram. Our next steps is to take this to our expert advisors and get feedback on what to change and what to keep, and then send this in as part of our Earth Sangha Plant Grant application. Wish us luck! 18 Black Eyed Susan 6 purchased/donated? Our plant grant in person!